From Lizzie Mary Cullen, the illustrator behind hit colouring book The Magical City, comes a brand new treat for the winter. Settle down by the fire and immerse yourself in this mesmerising new colouring book for adults and children alike. Join celebrations across the world and throughout the years, from skating at the Rockefeller Center to surfing in Sydney and frost fairs on the Thames to Victorian toy shops. Travel with the wise men following a star, spot Santa's sleigh skimming over the rooftops and discover dazzling gingerbread houses with Lizzie's intricate inky illustrations. 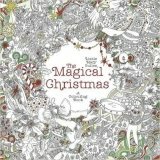 Fans of mindfulness and art therapy will love this beautiful Christmas gift book. A whole world of festivity is waiting for you inside. . .